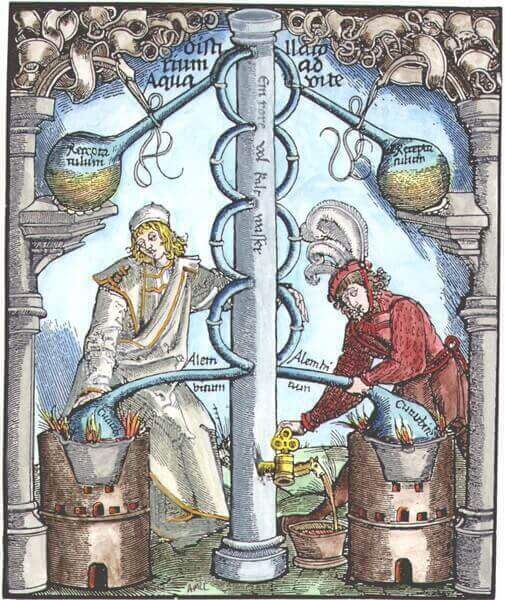 Alchemy and Hermeticism are two teachings that cannot be separated from each other, although they have experienced a different geographical spread. Hermeticism developed mostly in the West and in the Middle East: Egypt, Greece, Asia Minor; while the alchemical operations were practiced almost everywhere and in all times: in the West of the Middle Ages and of Renaissance, in the Near East and the Middle East and also in India and China. In the West, they are closely related to each other, their research together being necessary for their better understanding and interpretation. Alchemy: The term alchemy comes from Arabic – el-kimya and from Greek in its root kimya, word that allegedly derives from Khem, The Black Land, name that was attributed in antiquity to Egypt. The Western alchemy, as well as the Arabic alchemy, inspired by Hermeticism is known as an occult science dedicated to the transmutation of metals, both of the real ones and of the symbols which they represent. The Great Alchemical Work aims to sublimate matter, to release the soul from the material body, lead being transmuted into gold, transforming the ordinary human being into a superhuman. Alchemy does not work solely with matter, but also with the spirit, the transmutation targeting both domains, its objectives being The Philosophical Stone and the Elixir of Life. With a soul (sulfur) becoming lucid, the Adept will reintegrate his spirit (mercury) and will transform the commonplace matter into sublime forms (salts). The alchemical search targeted the Quintessence, the fifth essence, substance that allegedly is found in all things, being obtained after successive distillations. the Moon represented Silver, The Sun – Gold, Saturn – Lead, Mercury – Mercury, Venus – Copper, Mars – Iron, Jupiter – Tin. For alchemists, these notions do not designate only chemical elements, but represent philosophical concepts or qualities. Prima Materia (the first matter) possesses two attributes, a physical and a spiritual one, for which sulfur is the active principle and mercury the passive principle or the substance. Salt is the middle of union between sulfur and mercury and is assimilated to the spirit which unites the soul and the body. The alchemical High Magic rituals started from the precept that matter contains salt and it can be transmuted into pure gold. We cannot talk about Alchemy without mentioning the V.I.T.R.I.O.L concept, obtained from the first letters of the latin phrase: Visita Interiorem Terrae Rectificando Invenies Occultum Lapidem, which translates to Visit the interior of the Earth and by rectifying it you will find the hidden stone, the meaning of this phrase being that of penetrating the matter and after successive purifications, the hidden truth will be revealed. By the same formula, V.I.T.R.I.O.L, name given by alchemists to sulfates, the operative alchemists were trying to transform ordinary metals into gold, through a chain of combinations and chemical reactions with other elements. On an esoteric level we find the descent into the deep self up to its core. From this point begins the process of improvement of the human being. The Moon – inside the intestines. Similarly, the four elements were located so: Fire – inside the heart, Water – inside the liver, Earth – inside the lungs, Air – inside the bladder. Adept strived to operate the general transmutation of his whole being in order to reach a superior state where Saturn – Lead is transformed into pure gold. The Moon merges with The Sun, then, together with The Moon and The Sun, the mercury and the sulfur rise up to Saturn and project The Light – Gold. 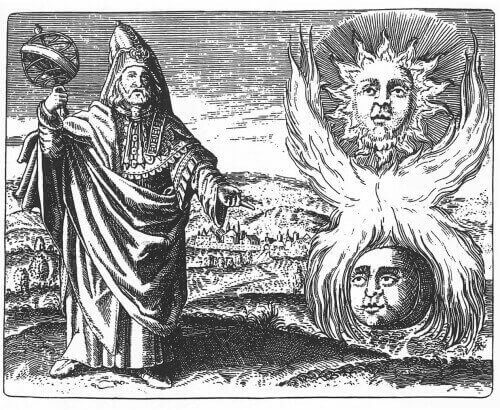 The Philosopher’s Stone, the main objective of alchemy is supposed to be Adam Kadmon of the kabbalists or the Androgynous from the Western alchemy, the initiate that recognizes himself in the two aspects of his personality – masculine and feminine, at the same time. Hermeticism: Being present since the beginning of the Christian era, it expresses a synthesis in which the Egyptian god Thoth and the Greek god Hermes are overlapped, even merged. Hermes was called Trismegistos, Thrice the Great, whereas he possesed three parts from the wisdom of the world: Alchemy, Astrology, Theurgy. ordinary and profane human by knowledge of his superior reality and the powers that are hidden beyond of his apparent nature. 3) And as all things are, and come from One, by the mediation of One, So all things are born from this unique thing by adaptation. 7.a) You separate the earth from the fire, the subtle from the gross, gently with great industry. This defining text for alchemy highlights the fact that everything that is divine materlializes and everything that is material spiritualizes. The Macrocosm is in close connection with The Microcosm, both of them being situated in a relationship of interdependence. The human being has power over the superior principle which is situated on Earth and inside himself. His duty is to separate the subtle, to assimilate the terrestrial and to bring it a spiritual, celestial influx, this One that is present in everything being the primordial Chaos from which matter was ordered.